There has been a lot of speculation about UM Motorcycles bringing in an adventure tourer. The company has finally broken its silence and announced the launch in early 2019. The bike in question is likely to be the DSR Adventure TT showcased recently. In terms of design, the DSR Adventure TT looks like a true-blue ADV. With a 21-inch spoked wheel up front and a 17-incher at the rear, the bike looks built for the purpose. The upright riding posture, tall windscreen and the flat rear rack further give it that adventure cred. Looking at the bike from the front, you might just be reminded of the Kawasaki Versys X-300 but in profile, it looks rather unique. It has the minimalistic appeal that you’d want in an adventure tourer. The UM DSR Adventure TT misses out on a LED/projector headlamps setup and makes do with traditional halogen bulbs. Weirdly, it doesn’t come with factory-fitted knuckle guards either. Behind the windscreen is a conventional semi-digital instrument cluster with speedo and tacho read-outs. Internationally, the UM DSR Adventure TT comes with a rather small 125cc single-cylinder liquid cooled motor that pushes 14.75bhp to the rear wheel. Torque stands at 10.9Nm. For India, however, UM is likely to plonk it with the same motor that works in the Renegade – a 279cc single-cylinder that develops 24.8bhp and 23Nm. While there is no official confirmation as yet, there is also the possibility of the DSR being fitted with the smaller 230cc oil-cooled motor from the Renegade Duty. The international-sped UM DSR Adventure TT comes with disc brakes at both ends and ABS as standard. Suspension duties are performed by telescopic forks up front and a monoshock at the rear. While the 125cc DSR weighs just 136 kilos, the India-spec model may be heavier if it comes with a more powerful motor. As an entry-level ADV, the DSR Adventure TT may find a lot of takers especially given the state of our roads. That being said UM will have to work on the quality of parts. When the UM DSR Adventure TT comes to India, it is likely to have just one competitor – the upcoming Hero X-Pulse. 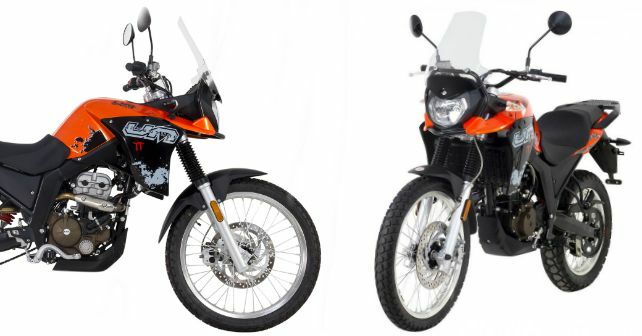 Along with the ADV, UM may also bring in two more motorcycles – the Renegade Vegas and Renegade Duty – to India as well.